Seems this may become the most powerful production Corolla. The upcoming engine will use direct injection and other technologies to wring over 160 hp from a 2.0L engine without a turbo. This will replace the Toyota Corolla iM. Final figures haven’t been officially released yet. Are they also making a standard sedan as well? Don’t know. Toyota’s website and other sites only talk about this version. Well, that would be great. However, hatchbacks in the USA market haven't really been all that popular - so I'd love to see the take up rate on that version if and when it comes out. The Corolla sedan isn't going anywhere. It's the #1 small car in sales. The Camry and Corolla sedans are not going anywhere. They both sold over 300,000 units last year and are doing well this year. .....and it's going to be offered with a manual transmission! 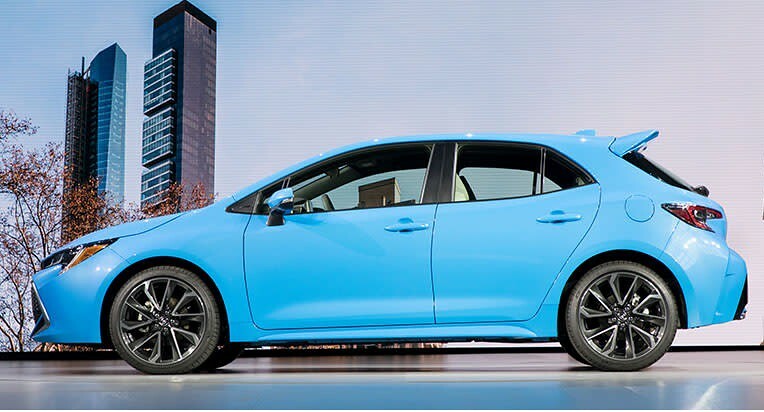 Here's the 2019 Toyota Corolla Hatchback. It looks a whole lot like the Toyota Matrix.